December has descended upon us at last, a time of holiday festivities, pretty decorations, and all-around good cheer. If you have found yourself looking for more ways to celebrate here on Neopets, then look no further, I have compiled a list of 10 ways that you and your pets can celebrate this holiday season! Ah of course, one of my favorite holiday activities, the Advent Calendar! A true holiday classic here in Neopia, stop by every day to receive a gift and watch a lovely little holiday animation. If you’ve never been, the Advent Calendar is located in the Happy Valley region of the Terror Mountains, and is totally free to visit, so be sure to stop by every day in December! Although making new pets is exciting, there are thousands of pets in the pound who are in need of a new owner and a loving home. If you feel that you can provide that to one of these pets in need, I encourage you to head on over to the pound and adopt one! Though these pets are always in need, the holiday season is a time where we celebrate family, and there is no better way to do that than bringing one of these pets into your family! 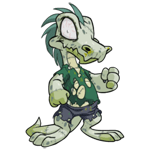 I’d especially encourage the kindhearted people of Neopia to consider adopting a badly-named pet, as these pets often go overlooked in the pound but deserve a happy family just as much as a well-named pet does. If you have been considering painting one of your pets a new color, there is no more festive color than Christmas! The Christmas paint brush tends to be one of the more affordable paint brushes out there, so this is a color change that probably won’t anger the Skeith at the The National Neopian Bank. Now, Christmas pets are not something you should keep out on display for the holidays and then abandon in January, they are a part of your family too! Should you find yourself tired of the Christmas festivities when the holidays are over, I would suggest that you either customize them differently or repaint them to give them a new look. I’ve personally found that many Christmas pets are highly customizable, as most of their holiday look comes from the removable clothing that comes along with their color, and you are left with a pet whose base color is quite versatile. As a bonus, you will forever have their holiday outfit to put back onto them, whether you repaint them or simply change their outfit! I really enjoy customizing my pets, and dressing up my pets for the holidays always puts me in a super festive mood! There are a lot of holiday customization options, whether you want to use Neopoints and NeoCash. Some cool (and affordable!) Neopoint options include the Gingerbread Background, the Holidays on the Space Station Background, the Festive Flower Arrangement, the Decorative Holiday Hair Bow, and the Holiday Bow Tie. This year’s Advent Calendar will also probably release a few new holiday wearables, so look forward to those as well! I know that I always loved reading Christmas stories and eating holiday foods, and why not give the same experience to your pets this holiday season? Books such as "Classic Neopian Holiday Tales", "Sleep Well, A Holiday Tale", or "A Very Tiki Holiday" can be fun to read with your pet to help everyone get into the spirit of the holidays! As far as food goes, it could be nice to treat your pets to a Christmas Dinner, perhaps with something like the Sliced Turkey Dinner. Other fun holiday classics for your pets include the Holiday Yule Log and Flying Holiday Neggnog! Many people decorate their real-life homes for the holidays, and why not decorate your Neohome too? I’m sure your pets would appreciate the festive surroundings! Just like for the customizations, there exist lots of Neopoint and NeoCash items to decorate your Neohome with. Some fun Neopoint options include the String of Holiday Kiko Lights, the Holiday Tiki Tree, and the Holiday Cut Out Raindorf. A festive avatar is a great way to show off your holiday spirit! Fortunately, there are tons of cool wintery avatars available! I won’t go into detail on how to get each and every one of them, but I will list off some of the festive avatars I know of, and you can head off to find yourself an avatar guide to show you how to obtain each of these. "Hissi - Ice", "Raindorf", "Not for Wreathale", "Taelia the Snow Faerie", "Kiosk Wocky", "Plastic Fir", and "Seasonal Attack Pea"
"Snowroller", "Snowmuncher", "Chocolate", "Wocky - Snow Day", "Snicklebeast", "Whee! ", and "Let it Snow!" "Stamp Collector - Snowy Valley", and "Snowager - Rawr!" Once you have one of the aforementioned wintery avatars, it can be fun to create a holiday font to match it! If you’ve never made your own font before, there are lots of guides out there made by helpful Neopians, and you can try it out for the first time! I tend to like to put lyrics from Christmas songs into my holiday fonts, but you could just put a bunch of the holiday neo-smilies in your font and call it a day if you wanted to! Alternatively, if you don’t have an interest in learning to make fonts, you could also look around for a pre-made holiday font, and still feel just as festive! This is something I enjoy doing during the holiday season, and it can spread a lot of holiday cheer! I like to buy a bunch of fairly inexpensive holiday items, such as Candy Cane, Green Stocking, Plate of Holiday Cookies, or Happy Holidays Card, and send them to random people I see on the Neoboards (or wherever you tend to stumble upon random Neopians, but I typically find them on the boards). The fun of it is really in just sending them out at random and not announcing that you’re looking for people to give gifts to, as everyone loves a nice holiday surprise! An alternative to sending out holiday items could be to try and randomly send people things off of their wishlists, if they have one. These gifts may be more appreciated than the random holiday gifts, but then you can only give gifts to people who actually have a wishlist, and I personally don’t feel like that’s as much fun. Of course, if you are going to send gifts to anyone, it would make sense to give gifts to your closest Neofriends. I’m sure you know of a few things they might like, or if not, maybe check and see if they have a wishlist that you can pick something from. Or perhaps if you have a creative talent, you could draw a picture of one of their pets for them, or code a userlookup for them! Or really, a great (and free!) gift for any friend is to write them a kind Neomail telling them how thankful you are to have them as a friend. I’m certain that whatever you choose to do for your Neofriends, they will appreciate the thought and care that you put into it!